Serena Williams remains on course to defend her Australian Open title after comfortably reaching the third round. (CNN) -- Defending champion Serena Williams swept into the Australian Open third round with a 6-2 6-1 win over unseeded teenager Petra Kvitova in little over an hour on Thursday. It was a wholly dominant display from the world number one, who dropped just three points on her first serve while winning more than half of the points on Kvitova's service. Williams is chasing a fifth Melbourne title and ominously for her rivals said she was already nearing peak form and fitness. "I thought I was a little bit better than my first round match," said Williams, who had come into the tournament under a fitness cloud after limping through her defeat against Elena Dementieva in the final at Sydney last week. "I felt like I was moving better and I had better energy. I just felt all around a lot better. I don't think I'm that far from full fitness and I felt like I could have actually played a lot better," she told reporters. 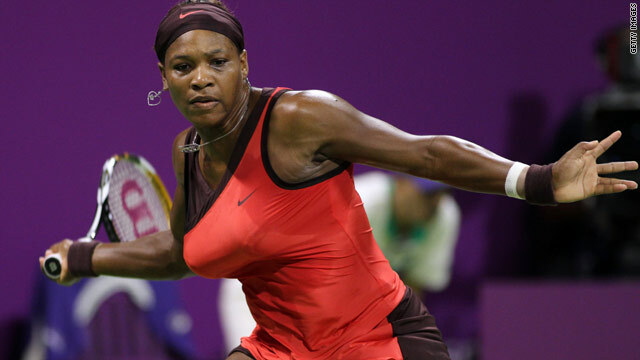 Williams will next play 32nd seed Carla Suarez Navarro, who beat Germany's Andrea Petkovic 6-1 6-4. Sixth seed Venus Williams, who is chasing her first Australian Open title at the age of 29, claimed her second consecutive straight-sets win as she was similarly untroubled by Sybille Bammer 6-2 7-5. It was the second left-hander Williams has played and she will meet another in the last 32 after unseeded Australian Casey Dellacqua defeated Karolina Sprem 7-6 7-6. Meanwhile, former world number one Ana Ivanovic continued her disappointing grand slam form since winning the 2008 French Open as she was bundled out by 36th-ranked Gisela Dulko 6-7 7-5 6-4. It is the seventh major in succession the Serbian has failed to get past the fourth round and she admitted her growing frustration at the early exits. "It hurts, I must say," she told reporters. "I think I just have to be patient. It will take some time. I do feel better on the court. I feel like my old self. "There are still some areas that are not there for me to rely on when I need them the most. Some matches it's there, some not." Fourth seed Caroline Wozniacki played for the second consecutive day but showed no ill-effects with a trouble-free 6-3 6-1 win over Germany's Julia Goerges. Belarus' Victoria Azarenka reached the third round of a grand slam for the 11th consecutive occasion with a simple 6-4 6-0 victory over Stefanie Voegele, while Agnieszka Radwanska, the 10th seed, and 17th seed Francesca Schiavone both had straight-sets wins and will now meet in the third round. Australia's top hope Samantha Stosur (13) will avoid a seed in the next round after the Queenslander beat Kristina Barrois 7-5 6-3. Unseeded Italian Alberta Brianti lies in waits for Stosur after she upset 21st seed Sabine Lisicki 2-6 6-4 6-4. Other seeded players to progress were China's Na Li (16), Daniela Hantuchova (22) and Shahar Peer (29).